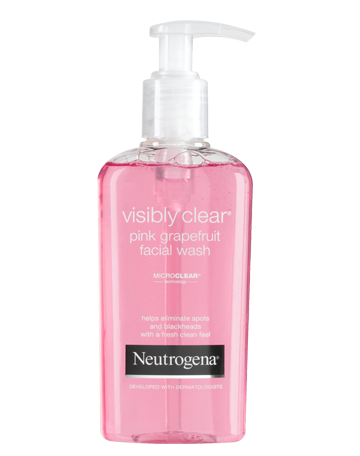 NEUTROGEN VISIBLY CLEAR ® Pink Grapefruit Facial Wash is a refreshing washbasin for everyday use. Your skin looks cleaner and fresher every day. Thanks to the unique MICROCLEAR ® technology, the product deepens the skin and helps to reduce fins and blackheads. The rejuvenating peanut oil cleanses the skin gently but does not dry it, while the fresh scent of smell deliciously stimulates your mind! Hiero aamuin illoin kostutetuille kasvoille. Huuhtele huolellisesti. Vältä aineen joutumista silmiin. [PR-015653] Aqua, Sodium Laureth Sulfate, Propylene Glycol, Lauryl Glucoside, Sodium Lauroampoacetate, Cocamidopropyl Betaine, PEG-120 Methyl Glucose Dioleate, Salicyclic Acid, Benzalkonium Chloride, C12-15 Alkyl Lactate, Cocamidopropyl PG-Dimonium Chloride Phosphate, Citrus Grandis Fruit Extract, Sodium Benzotriazolyl Butylphenol Sulfonate, Polysorbate 20, Sodium Chloride, Disodium EDTA, Citric Acid, Sodium Citrate, Parfum, CI 16035, CI 60725.